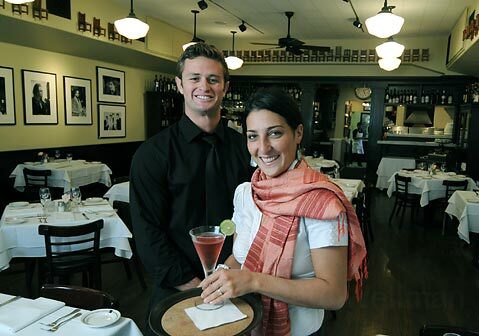 Tre Lune bartender Patrick Rathbun (left) whipped up the cosmo that manager Elisa Zampiga is getting ready to serve. Where: 1151 Coast Village Rd., 969-2646. What: Upscale Italian cuisine in Montecito’s Lower Village. How Much: Antipasto $10-$19, pizzas $13-$17, veal osso buco con risotto $32. The Dish: Tre Lune’s three slivered moons mark the outside of this highly praised Montecito culinary landmark. Serving upscale Italian cuisine for breakfast, lunch, and dinner, the restaurant offers an extensive menu distinguished by being very traditionally seasonal, with high priority placed on fresh produce. Venetian influences are found in the array of seafood dishes and risotto, while Tuscan simplicity fills in any edges. An aesthetically clean interior houses dark hardwood floors, classic photographs, and white tablecloth-dressed tables. The menu is broken up into Zuppa & Insalata, Antipasto, Pizza, Pasta & Risotto, and Carne & Pesce, each category listing an array of options. Classic capricciosa pizza (artichokes, mushrooms, ham, and olives) will please patrons familiar with the traditional recipe, and Milanese-style osso buco is melt-in-your-mouth delicious for lovers of braised veal shank. Sidewalk seating is available in front of the restaurant on trs chic Coast Village Road.